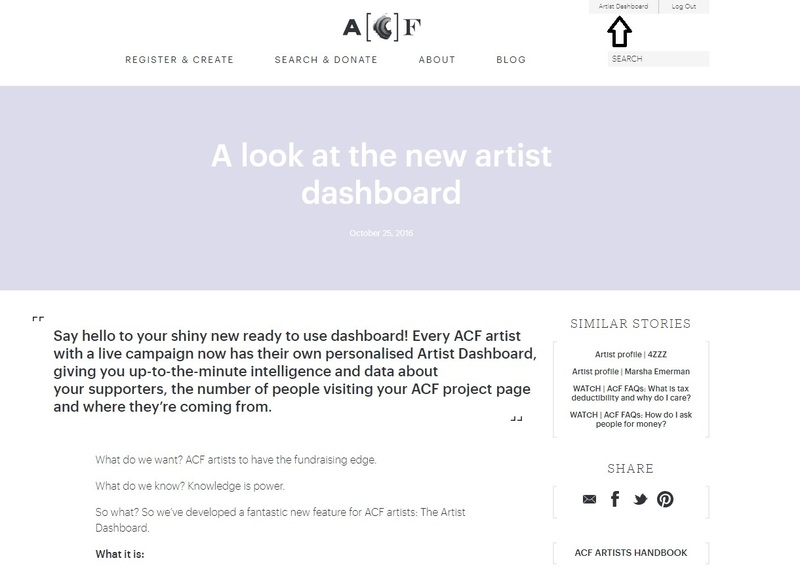 Every ACF artist with a live campaign has their own personalised Artist Dashboard, giving you up-to-the-minute intelligence and data about your supporters, the number of people visiting your ACF project page and where they’re coming from. Once your campaign is live, click on ‘Artist Dashboard’ in the top right hand corner of any page (see image below) and use your ACF log in to start using its features. The dashboard gives you up-to-the-minute intelligence and data about your supporters, the number of people visiting your campaign page and where they’re coming from. It also allows you to post brief updates to your campaign and project on your page, upload new images and video, and contact your donors. You’ll be able to see where your promotional efforts are having the most impact, and make informed decisions about where to invest your fundraising time and energy. Was your new video post really popular on a Thursday? Consider a regular #ThursdayVideo update! Is most of your traffic coming from Twitter? Might be time to schedule more tweets! Five new donors in the past few days? Message them directly from the ACF to say thanks, and encourage them to spread the word about your project! The ACF dashboard is your ticket to knowing more about your current and potential supporters, and adapting your fundraising strategy to the way they’re behaving. Plus, you can fully integrate your ACF project page with Google Analytics, giving you easy access to the wealth of information this free service offers. Contact your backers. You can contact and access donors details (including email and the donated amount) whenever you want. Upload new media. You can curate, update and reorder your images and video. And the best part, you can do it all in real time. Are you an ACF artist with a live campaign? Your dashboard is up and running! Use the log-in you created to access it now. Not an ACF artist? Now’s the time to join us and get access to these great new features. Registration is simple and once your campaign page is up and running you’ll be generating donations and tracking your performance in no time. REGISTER NOW.